This is a continuation of the typecasts of my trip to Melbourne. 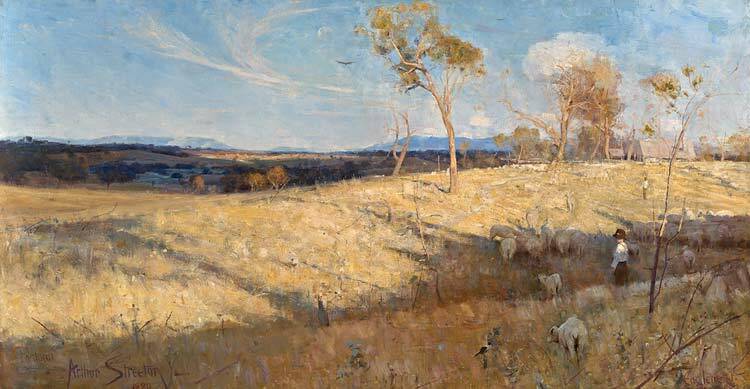 Arthur Streeton: A golden summer. A quick photo I took of one of Robert’s sculptures. Note the corresponding painting in the background. I went to high school in Essendon, and in Melbourne the your team is often your tribe. The Essendon colours are etched permanently in my mind – despite being a Fitzroy supporter. Robert Clinch: Sign of the times. 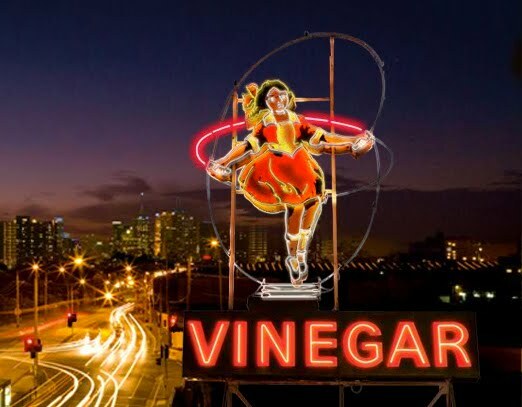 The very familiar (to Melbournians) Nylex sign, and ‘Skipping girl Vinegar’ signs have been ‘Coked’. The subject of why these ageing signs are so loved by Melbournians is an entire blog post on its own. 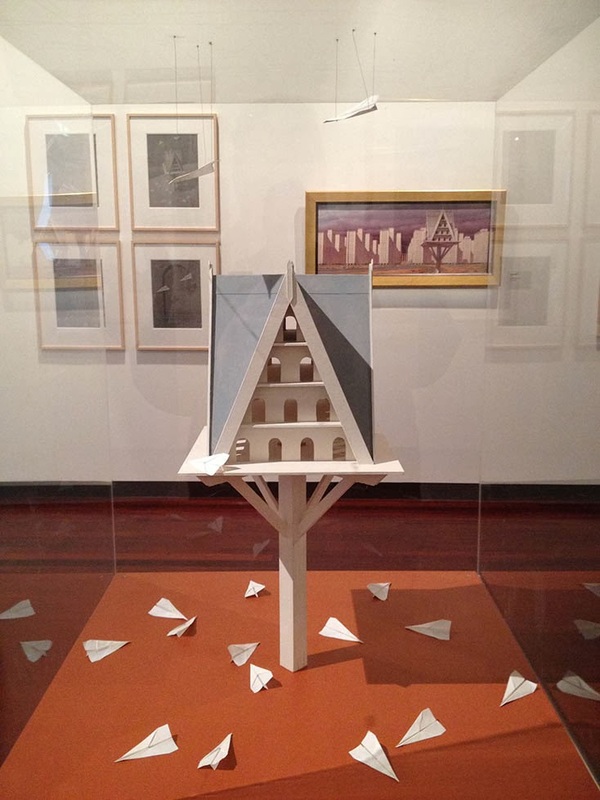 Robert Clinch: From bauhaus to our house. I really love Robert’s sense of humour. Just for reference, I don’t have permission to post the images of those artworks that are displayed above. They are linked directly to Robert’s website, which can be found HERE. Please, pop over and by his book (or even a painting?) so that he feels the exposure has been worth it to him and as such won’t ask me to stop displaying his works. Meanwhile, if you’re ever in near somewhere his paintings are on display, GO SEE THEM. The pictures on here just don’t do them justice at all. 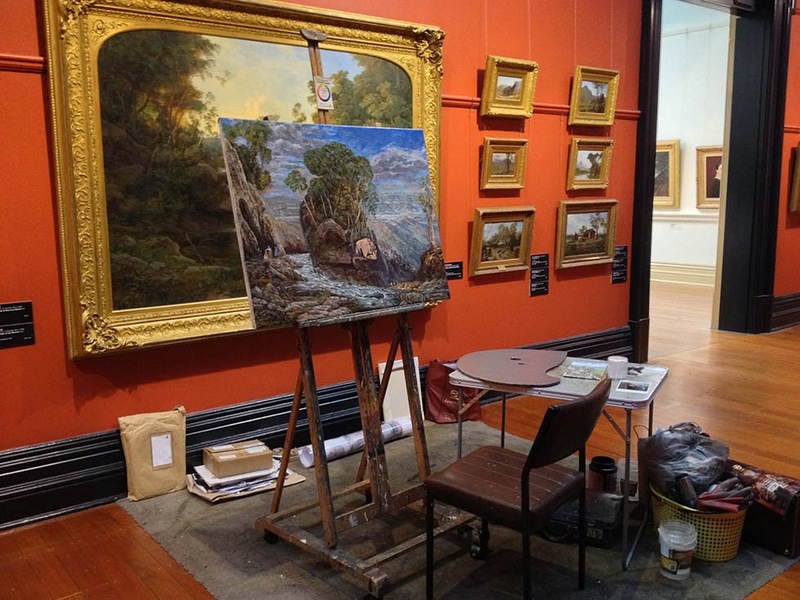 November 5, 2013 in art, Ballarat, love, painting, Robert Clinch, typecast. ← I’d buy that for a dollar, or three. 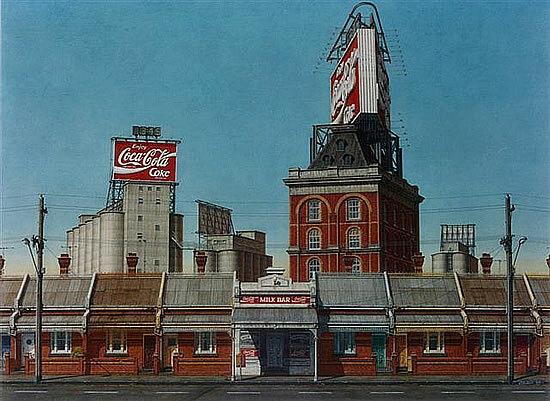 I like Clinch's pieces a lot. Rather Hopperesque. The colours were faded in these online pictures, but they keep the character and the feel of the paintings – most of which are huge. 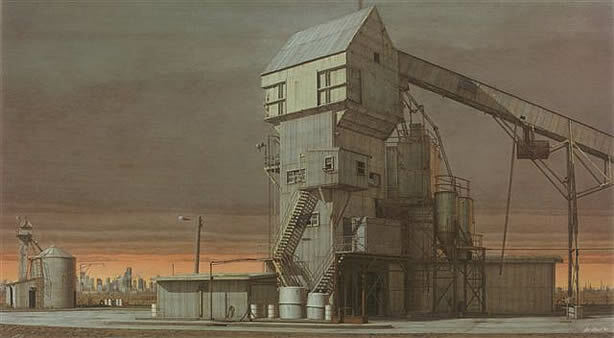 I love Hopper's works. There's a certain level of sensuality in them which made every one beautiful. 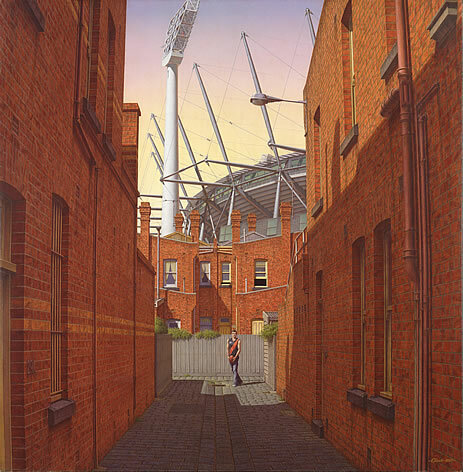 I swear I recognise that laneway in the 'Spartacus' painting. It's between Clarke and Charles Streets in Northcote. But then Melbourne is full of lanes like that one. Brilliant. I, too, love industrial landscapes; stark and decaying. I get a lot of that here in Tbilisi. 🙂 Even some of the Soviet-era neighborhoods have an “industrial” feel to them. The Mercedes truck reminds me of being a small child and learning of the Australian road trains. (I'd never heard of British Leyland before then and it sticks specifically in my mind associated with them.) In the US we have do trucks with three short trailers, but I've only seen three in my life. These are really stunning paintings, thanks for introducing Mr Cinch! great post. typosphere + art = good internet. Road trains are scary. We don't allow them within about 400-500km of our major cities. You know, I have an obsession with european and Russian industrial complexes. Here in Australia we haven't had anything near the level of industrialisation as other countries, and it always seems like these places are in another world. Whenever I come across photo projects of neglected ex industrialised areas in this part of the world I find it incredibly fascinating. I also care a lot about the stories of people who had worked in these areas and what their lives are like now. Teeritz, for the first few paintings I did exactly that. I strained my head around trying to figure out exactly where the location was. 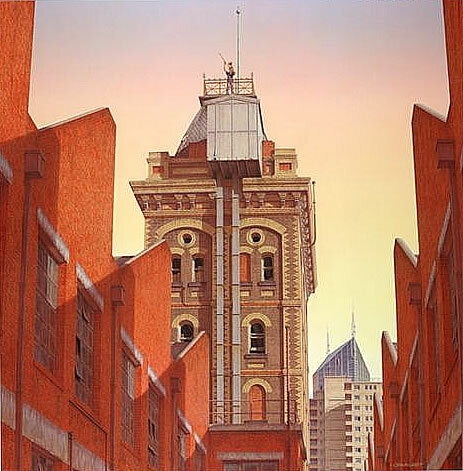 It wasn't till I looked at other paintings that featured familiar architecture that just didn't seem…. right… that I realised that the artist was taking liberties with the landscape and slotting elements together that would make them seem familiar, but were actually impossible combinations of known landmarks. Was glad I could share the love! I agree. We have such creative and intelligent minds collected in the typosphere. I always feel that it is the right audience to share great art and ideas with.